Review #68: The Karate Kid. The original and the best of the Karate Kid Franchise revolves around Daniel LaRusso, a young school boy who finds himself in strange surroundings when his mother gets a new job in a new city. At school a rich-kid ‘in’ crowd made up of slightly older boys bullies him relentlessly due to Daniel’s smaller stature and smaller bank account and that he has taken a liking to the ex-girlfriend of the leader of the crowd. This crowd also happens to be martial arts students of a man called John Kreese, a brutal and hard-nosed instructor who teaches the boys to hit first and show no mercy to their enemy. During one of Daniel’s particular encounters with the crowd, an old Japanese man called Mr Myagi, who works as a maintenance man in Daniel’s apartment block, appears out of nowhere and saves Daniel from quite literally being beaten to death. Mr Myagi agrees to go to visit Kreese with Daniel to put a stop the bullying but ends up challenging Kreese in a martial arts showdown in an upcoming tournament between Daniel and Kreese’s students. It’s a pretty simple story of beating the odds, and the wimpy kid getting turned into a stronger person, both physically and mentally with the help of a wise old wizard of a character. Being that the movie was put together by pretty much the same team that put Rocky together gives you an idea of what to expect. What makes Karate Kid special is the writing and screenplay, it’s fantastically put together and you really get on the side of the protagonists and begin to care about them. The other thing with the writing is when Daniel is in peril, you really feel it. Some of the ‘training techniques’ were written solely for the movie by an actual martial artist and seem a little cheesy at times, but they’re some of the most quoted phrases and movements in movie history. Even with the slight cheesyness, they actually work and give the audience something to relate to. Another special thing about the movie is the acting. Martine Kove as John Kreese isn’t seen on screen very much but his impact on the movie is lasting. Kove made it into my top 40 villains list too. 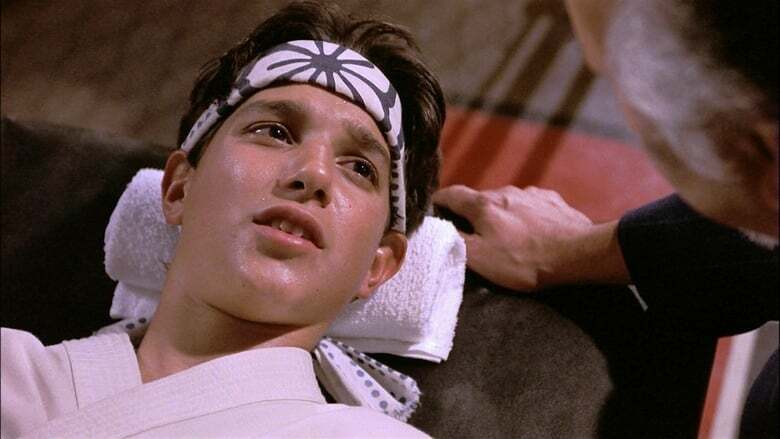 Ralph Macchio as LaRusso is another wise choice by the filmmakers. He’s weedy and puny and has a chip on his shoulder at the start but as the film progresses, Macchio really comes into his own and actually seems to grow with the character. Noriyuki Pat Morita though as Mr Myagi is an absolute gem of a character and Morita absolutely nails the role and if it weren’t for the brilliant story writing he would almost steal the entire movie. The filmmakers almost didn’t cast Morita due to his comedy background but he really shows his worth as a serious actor and can show the subtle humorous side of Myagi brilliantly. The soundtrack of the film is also bang on. Some of it is a little dated with the 80s pop tracks but the heavy bass pop-rock heard in the film’s final scenes and the oriental backing track that’s used throughout for Myagi and Daniel’s training, really give the movie some substance. A big let down for The Karate Kid though is the sequels and the awful remake. The first and original movie should be treated as a stand-alone. To be honest, I don’t even own the sequels. All in all it’s another 80s classic from me and has influenced the underdog genre since, and simply, it's just a lot of fun to watch.